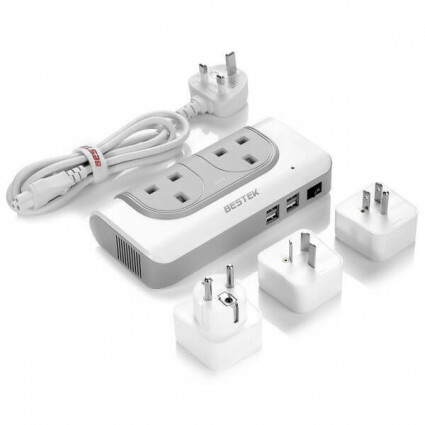 BESTEK international voltage converter converts voltage from 100V-240V to 230V, great for powering up UK devices. 3 additional travel adapters support more than 150 countries all over the world, perfect for worldwide travel. 4 smart USB ports enable you to charge mobile devices at the same time quickly. The travel adapter is compact and portable, a must-have for travel. Converts worldwide voltages from 100V-240V into UK standard voltage 230V, allowing you to charge UK devices when traveling abroad. 4 USB ports and 2 AC outlets enable you to charge up to 6 devices at the same time. The USB ports are auto-identified, can charge devices faster than ever.